There are like hundreds of ways to marinade a chicken. 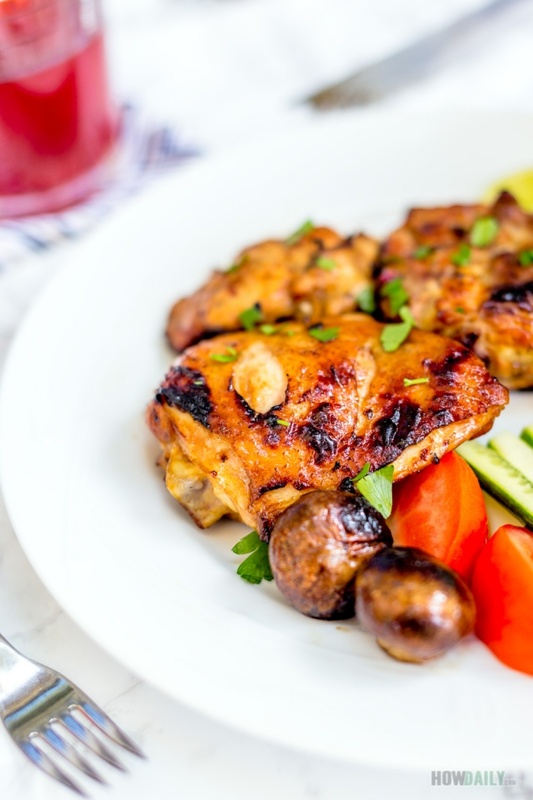 Salty, sour, sweet, spicy… or any swirl in between, yup, any chicken lover or meat eater would love a grilled chicken marinade. Why? 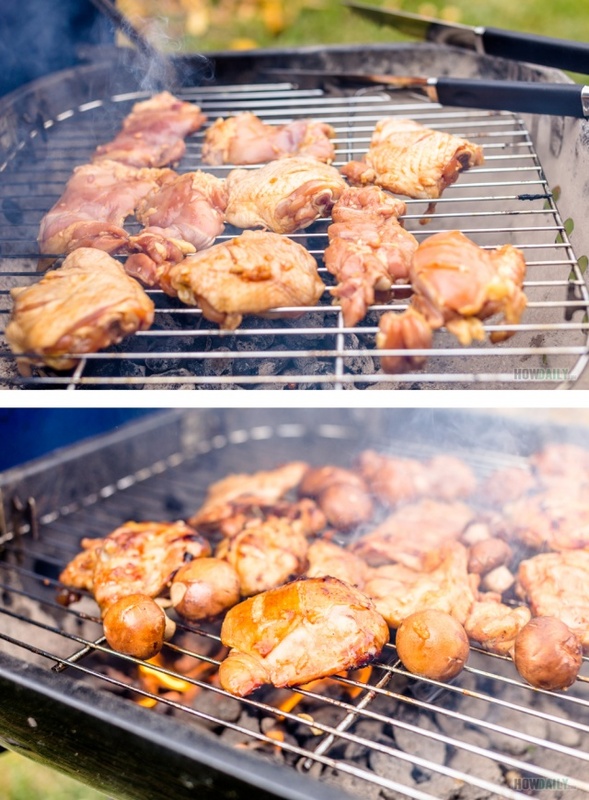 Cause grilling just make the scent and flavor of a chicken and its marinade up a knot. Sizzling fat over charcoal, glazing chicken, sweet and moisture flavor…imagine that. Anyhow, a marinade recipe, no matter what is was, would contain some sort of saltiness, sweetness, spice, aromatic ingredients, sourness, etc. and some oil to prevent burnt. 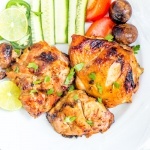 A simple chicken marinade – such as this recipe, involve using soy sauce (to bring salty and nice color), palm sugar/honey (for sweet and extra flavor), garlic and onion (aroma). So the next time you have a cookout grill, don’t for get to shake up some marinade for your chicken. You can choose any parts, from breast to drum. This recipe would work with oven grill and sauce pan over stove top too. It’s just that without the charcoal, the scent might not as mesmerizing. 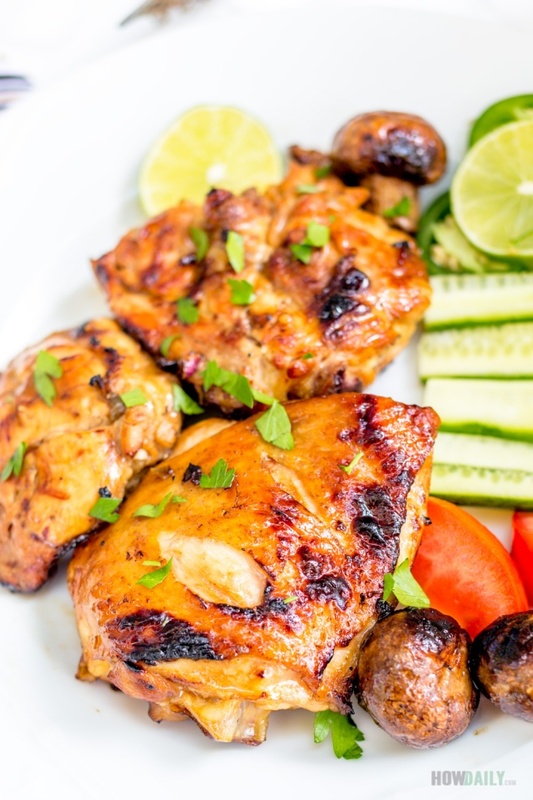 One of the best grilled chicken marinade with easy to find ingredients, this will be your favorite grab for a cook out or at home dinner. Work with any types of chicken meat: breasts, thighs, drumsticks, wings..., just pick your favorite for a moist, flavorful and tasty meal ever. Wash the chicken, pat dry. Slit and few diagonal line on each breast or thigh. Mince garlic and finely chop shallot. In a container w/ lid or large zip lock bag, add all the marinating ingredients. Then add in chicken breasts/thighs. Close the lid/zip the bag and shake rigorously to mix. Let marinade 2 hours or preferably overnight in fridge. Place chicken piece onto grates, grill each side for 5-6 minutes or until fully cook. Use a food brush to glaze and baste marinade sauce/liquid all over chicken surface in between. When done, remove from grill onto serving plate. Sprinkle some chopped herb to garnish and decorate. If you have no grill, just preheat oven to 400 F.
Arrange chicken onto baking rack over shallow tray. Bake/roast for 5-10 minutes, baste some sauce then bake for another 15 minutes. Turn over and glaze with remaining sauce. Heat a sauce pan with high heat. When hot, add 1 Tbsp cooking oil, pan and twirl to evenly coat the pan. When oil is hot, add chicken breasts/thigh (without sauce). When one side turn lightly brown and crust, turn over and fry the other side. Pour in all the marinade sauce, add some water if sauce level too low. Bring to boil then reduce heat. Cover the pan and cook 5-10 minutes. When chicken are fully cook, remove lid to evaporate all liquid. Turn and gently move each chicken piece to evenly coat/glaze with the reduce sauce. Keep heating until all the sauce is reduced and form a darkening glaze around chicken (not burn). Turn off heat. Let sit for a couple minutes before garnish and serve.